Suitable for Petrol vehicle with Cast Wishbones only. About Powerflex EPTG Ltd (European Polyurethane Technologies Group) was formed in the UK in 1996 to take advantage of the significant advances made in the development of polyurethane in recent years. 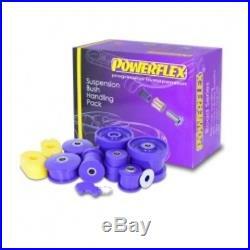 The company has wide experience of automotive suspension and chassis systems and combining these design skills with advanced polyurethane manufacturing techniques led to the development of the wide range of high performance automotive polyurethane components now known the world over by the product name POWERFLEX. We try to respond to messages within 24 hours. If you do not receive a response within 24 hours please send us another message. Please be aware that some of our items are made to order and can carry up to a 14 day lead time. Information on lead times for all made to order items will be included in the Product Description. Upon receipt of your order you will be asked to sign for the goods received in good condition. The item "Powerflex Handling Kit for Audi S3 MK1 (8L) 4WD (1999-03) Models PF3K-1002" is in sale since Saturday, December 05, 2015. This item is in the category "Vehicle Parts & Accessories\Car Parts\Other Car Parts". The seller is "wg_motorparts" and is located in Rochester. This item can be shipped worldwide.